Chris tapped me on the shoulder. I picked up my phone. 7:52 a.m. The sun was shining into the room. I walked out onto the balcony of our chateau overlooking the pool. Seemingly, one could see for miles. I looked to fertile, rolling hills carpeted with lush greenery. As far as the eye could see were fields of corn and wheat — truly a farmer’s dream. I joined the rat race and got ready. We left at 8:30 a.m. We drove three separate cars driven by Gianmarco, Brandon, and Chris. I enjoyed our ride into town from the countryside; the small gravel road and fields of crops reminded me of my home in Nebraska. The Musée des Augustins, Toulouse. Upon our arrival, we met Jan Willem Jansen on the front steps of the museum. Jan is an organ professor at the Conservatory of Toulouse. He led us through the front entrance, through a courtyard, and through a latched large wooden door. The other side revealed an ornate façade with the console hidden behind the Ruckpositiv. Because of the large space in which the organ is housed, Jan commented that the sound is much better when the acoustic is filled with people and exhibits. We were fortunate to have the opportunity to have a masterclass with Jan Willem Jansen, the biggest take-away from which was that we needed "Tou-louse" ourselves more in the music. Below are a few notes that we learned collectively from our time working with him. 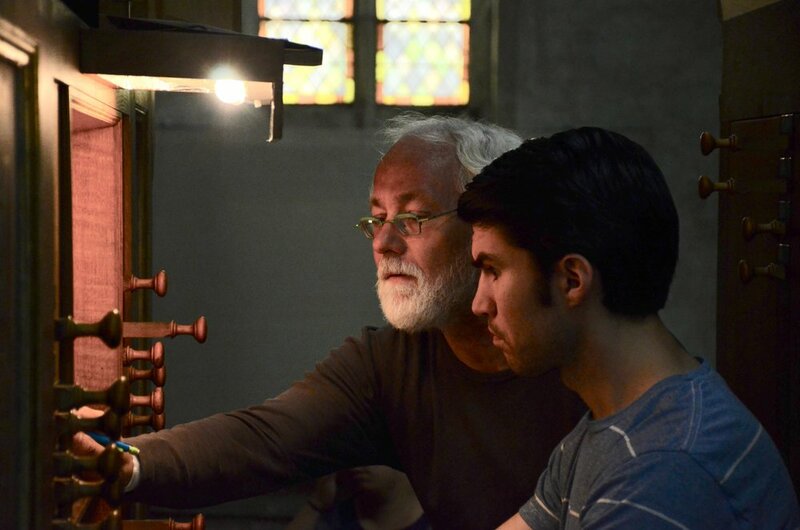 Jan Willem Jansen coaches Brandon Santini on Buxtehude's music. Boston Organ Studio. Prof. Jansen discussed the idea of finding a happy balance regarding both freedom and structure. He was helpful in identifying moments when rhythmic integrity should prioritize freedom. He mentioned how touch is another vital tool (besides rhythm) to add musical interest. Jan Willem Jansen coaches Jennifer Hsiao on music of Bach. Boston Organ Studio. 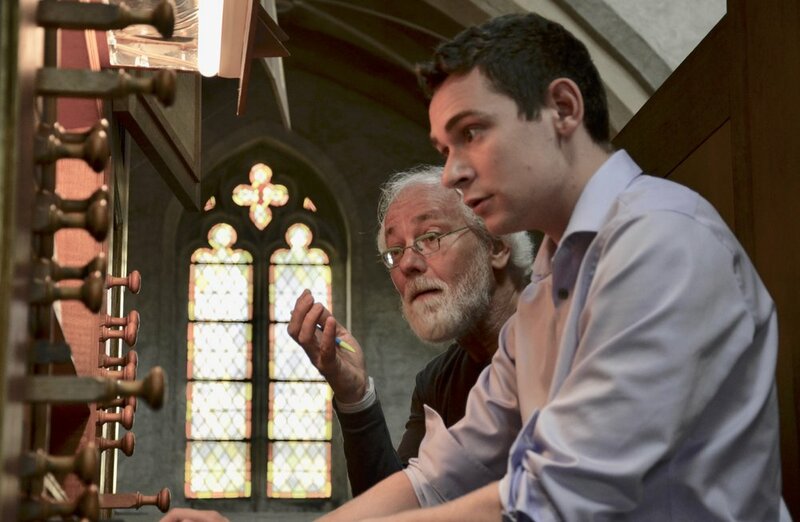 Jan Willem Jansen coaches David von Behren on music of Bach. Boston Organ Studio. Jan asked me to find a clear contrast between voices immediately imitated and voices with longer pauses between imitations. He helped me to breathe new life into a few phrases, while keeping other phrases simpler in their fluidity and articulation. His comments were very insightful and easy to immediately grasp conceptually in my playing. Jan Willem Jansen coaching Piece d'Orgue of Bach with Noel de Sa e Silva. Prof. Jansen talked about creating pedal accents, but to tailor them to one’s specific acoustic. He spoke of how the opening arpeggiations are heavy at the beginning, but become more “free” as the piece progresses. He also provided another edition that indicates an alternate way of splitting the arpeggiations within the hands. 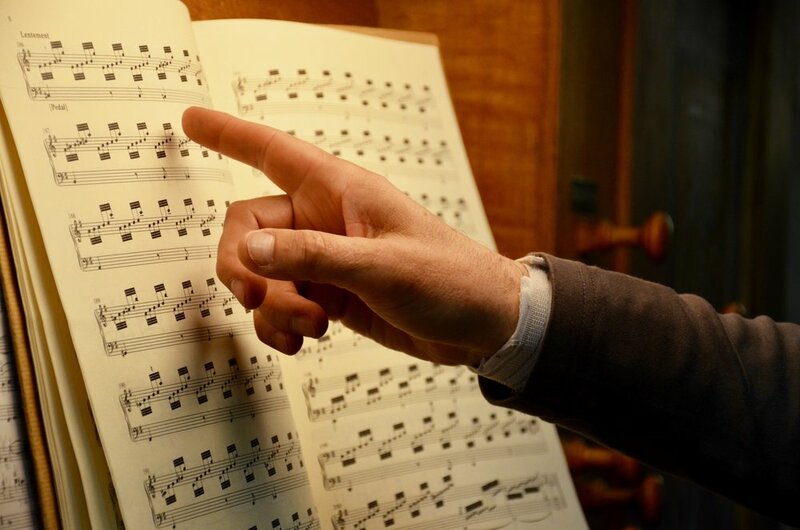 He showed Noel that the first section indicated with pedal (Barenreiter edition), could actually be played with the hands only. 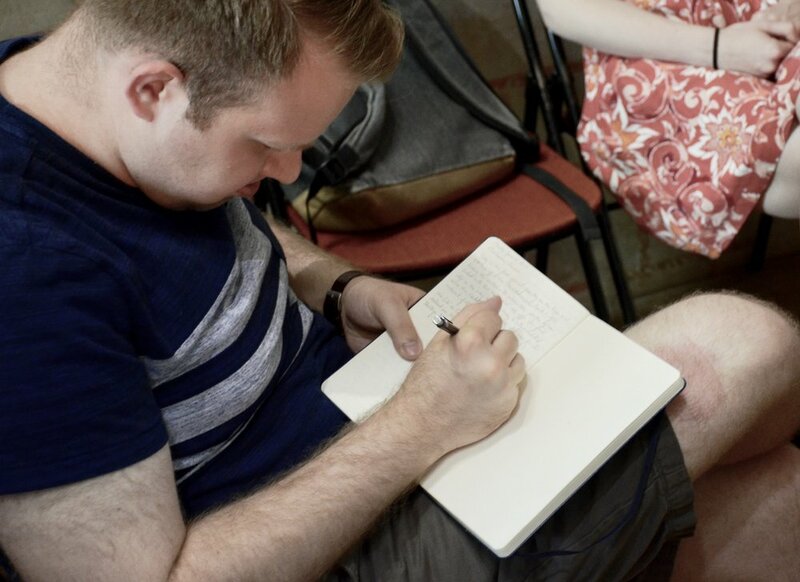 He also offered registrational ideas that added a further brilliance to the texture of the voices. Boston Organ Studio in Cintegabelle, France. That evening, we visited the French Classical instrument in Cintegabelle, a small and picturesque village south of Toulouse. The organ, built by Moucherel in 1742, is one of notable beauty. 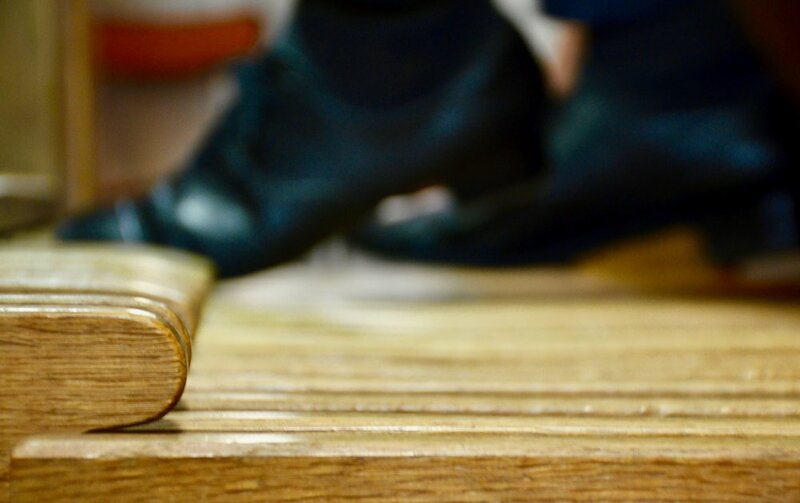 We were struck by how easy it was to play, and also by the incredibly rich sonority of the sound. 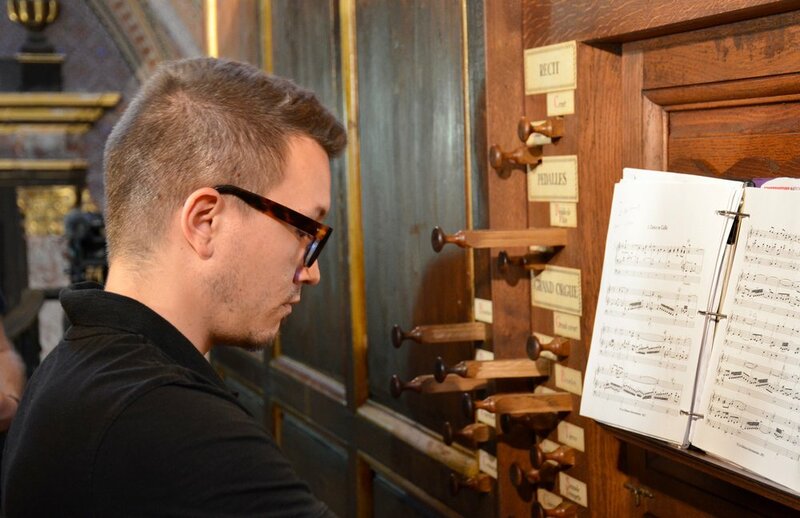 Emmanuel Schublin, the organist, offered insights on registrations as we each took turns playing through the evening. After a long day of playing and traveling, we returned home to a meal cooked by Noel, Brandon, and Gianmarco. It was a blessing to swim in our pool back at Le Carla; a great way to finish an exciting day! 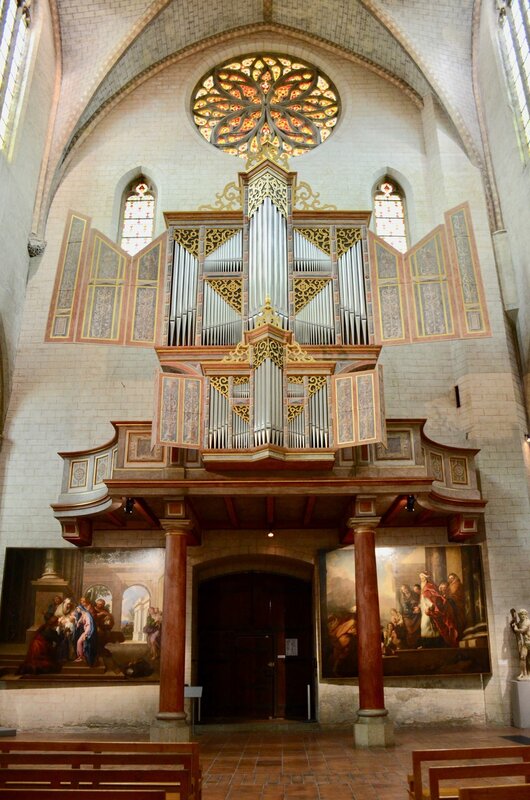 Ahrend organ, Musee des Augustins, Toulouse. Jan Willem Jansen coaching Brandon Santini in Musee des Augustins. 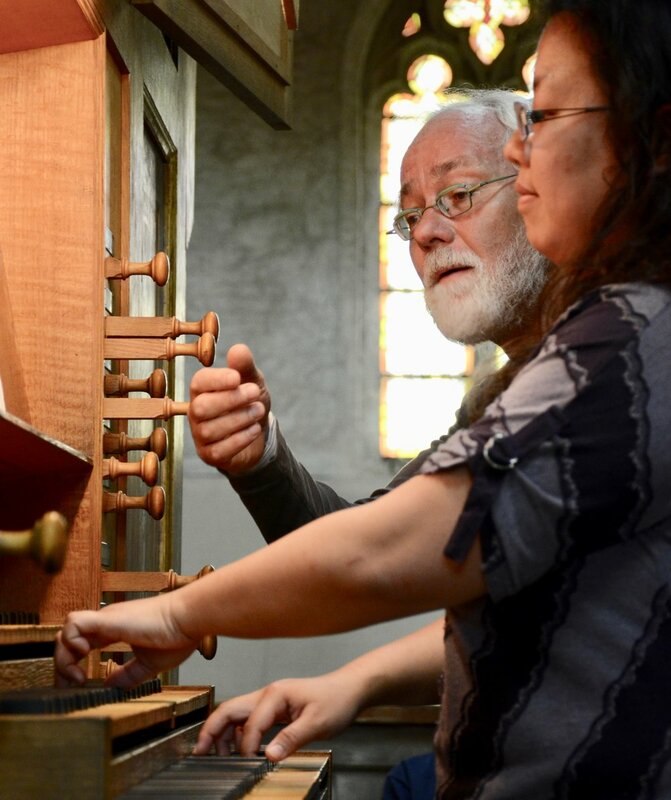 Jan Willem Jansen coaches Jennifer Hsiao on music of Bach in Musee des Augustins in Toulouse. Boston Organ Studio. David von Behren performs Bach for Jan Willem Jansen. 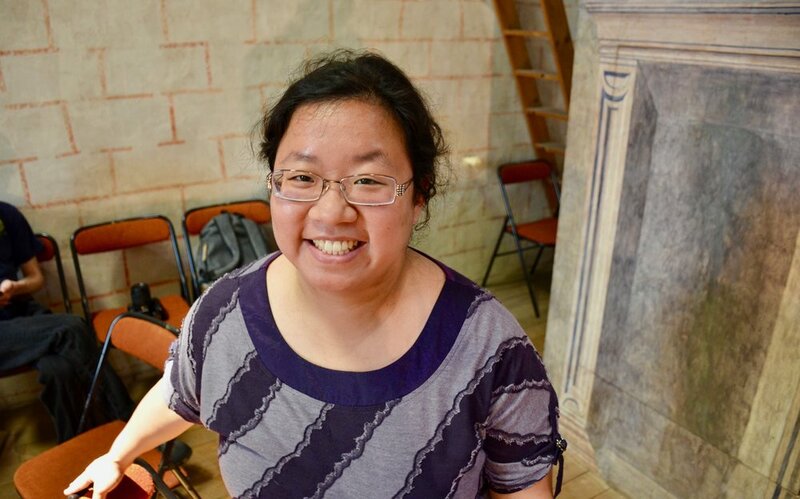 Jennifer Hsiao is all smiles at Musee des Augustins in Toulouse. 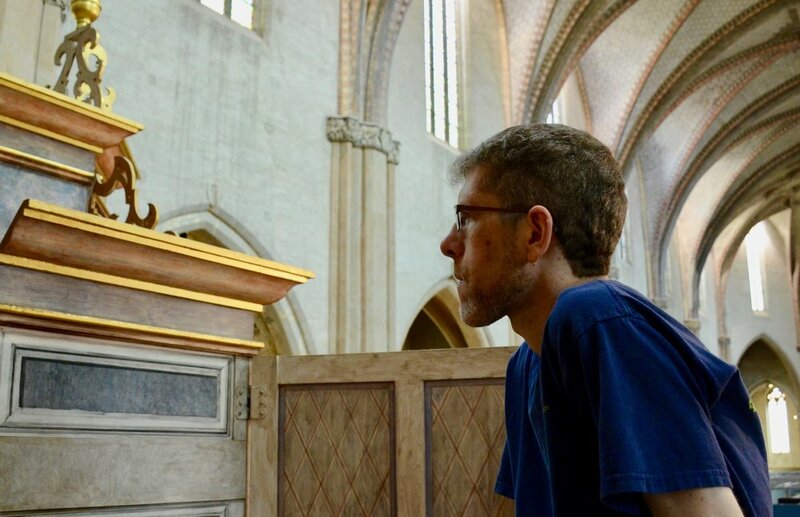 Corey de Tar plays the organ in Musee des Augustins, Toulouse. 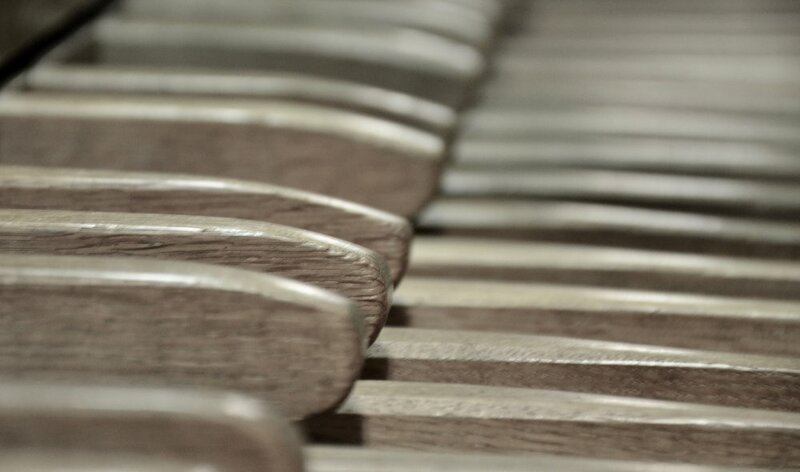 Blogging for Boston Organ Studio! Gianmarco Massameno, Laura Gullett, Noel de Sa e Silva, and David von Behren relaxing in the cloister of Musee des Augustins, Toulouse. 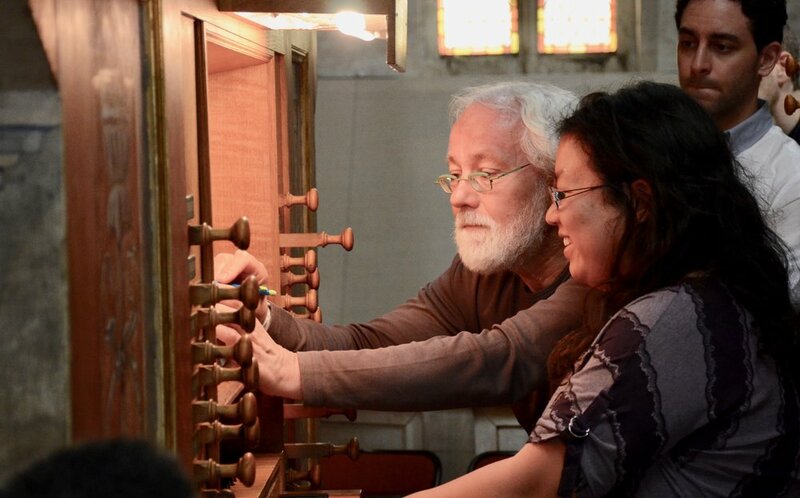 Boston Organ Studio members pose before the Ahrend organ in Toulouse. 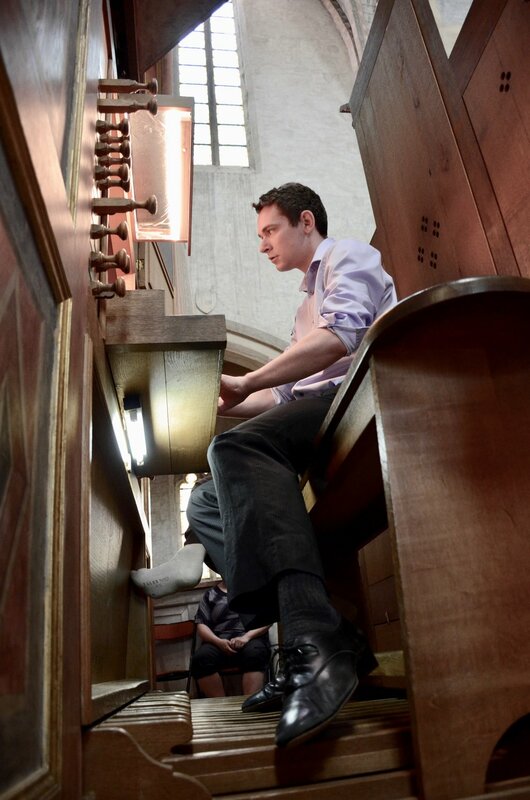 Chris Porter plays the historic organ in Cintegabelle, France. The historic organ of Cintegabelle, France. Boston Organ Studio. 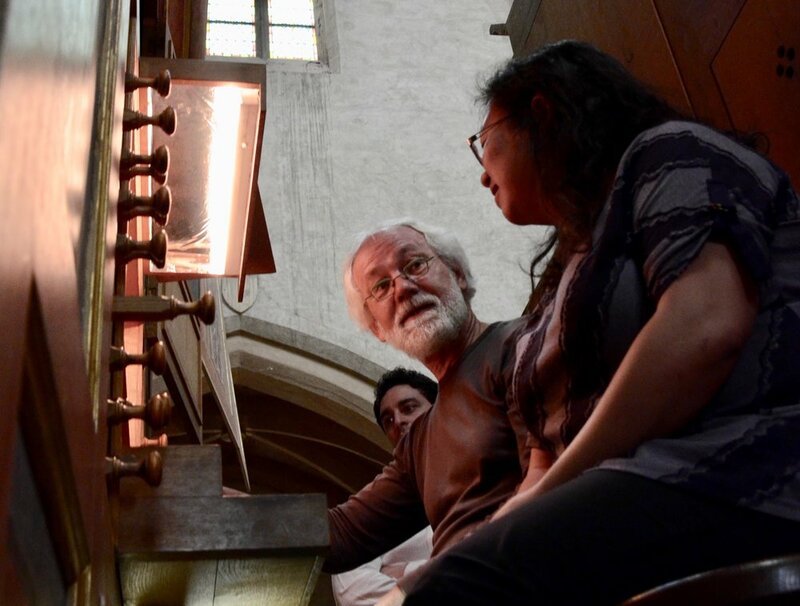 Members of Boston Organ Studio at the historic organ of Cintegabelle, France.